I am setting up a laptop on-site for a client's new user that starts on Monday. Monitor 2 has the Canadian curling gold medal match along with the four man bobsleigh running two video streams. 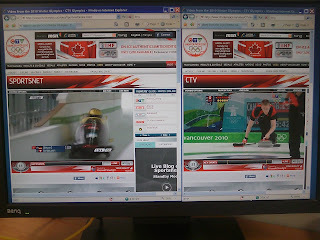 Our Canadian media group that includes CTV has had _constant_ Olympic coverage with virtually no in-play commercials. We have four or five HD channels available on the tube as well as online. They have done a phenomenal job with the coverage! In an effort to give as many folks as possible the ability to be a part of our upcoming live Webinars, we would like to know when would be the best time to do so. Please let us know what time is good and also whereabouts you are in the world so that we can begin planning our upcoming Webinar Schedule. We have done some live Webinars for South Africa, Ireland, and India. So, if enough folks from any given region respond, we will make the effort to be present at a time convenient to you! This link comes by way of Harry Waldron (blog link). The resources on this site are absolutely amazing! The links to free tools that can be used to detect and clean almost any type of virus or malware infection are priceless. This is one site to bookmark and it even has an RSS link for the reader! The instance name needs to be AUTODESKVAULT. If the instance has a different name, then the AutoDesk management server installation will want to install its own SQL Express instance. Since this particular client needs a full version of SQL due to the size of their database, we need that full version instance available when we are running the setup routine. The above screenshot Snip was in a support session where the bank that their client deals with has tweaked something so that IE7 and IE8 can no longer connect. So, the download of Firefox is on its way, but look at that speed! Our client’s site has a 3Mb ADSL connection. We have downloaded drivers from ATI and nVidia as well as from Intel’s site and we are seeing a huge impact on bandwidth here at the shop. Our pipe is a 6Mb ADSL connection with the CO being less than 300m away so we typically see 675-725KB/Sec download speeds. Perhaps the problem is localized to the Greater Edmonton Area (our client’s site is on the South Side) as the Canadian Women’s Curling team is currently playing and they just happen to be from Alberta! Hopefully this condition disappears at some point since the Women’s Hockey gold match between Team USA and Team Canada is later this afternoon and there will be no doubt that most of Canada will either be streaming the game or sitting in front of the HD TV! We are hoping for the latter as we plan to close up shop early today! There are a couple of small caveats when installing SQL Server 2008 on top of the Windows Server 2008 R2 OS. The routine wanted a restart before we got to installing the actual SQL bits. Oh, and one more thing. Make sure to download the appropriate SQL 2008 service pack and have it ready to install once all of the SQL instances are installed. In this case we have an SBS 2003 R2 Premium site that requires a dedicated SQL instance for their AutoCAD Vault setup. But, the management portion of the software is unable to be installed on SBS 2003. So, we needed another box with SQL. Unfortunately, the client was not willing to go much beyond dropping in a budget Windows Server 2008 R2 box with SQL licenses for the needed number of users at this point. So, we now have the needed SQL setup in place to get things up and running. One of the benefits of spending time with my fellow MVPs at the Microsoft MVP Global Summit was the ability to talk to so many different product group MVPs. In one conversation, there was talk about the “why” a server would spontaneously combust _after_ the Hyper-V Nehalem patch was applied. A clustering MVP, whose name unfortunately cannot be recalled at the moment, made it clear that the binding order on the Hyper-V box, whether in a cluster or not, must be ordered correctly. Now, for those of us familiar with SBS 2003 Premium RTM/R2 with ISA, one of the critical post OS and ISA steps was to check the NIC binding order to make sure that the LAN NIC came before the ISA NIC. Note that the NIC that has the Hyper-V Virtual Switch bound to it is _before_ the LAN NIC! Once we have done the above, we rebooted the server. We should now see a stable server setup. Note the hard drive sitting on its side on the right hand side of the chassis above. We put it together using some components that we had on the shelf so we were able to provide our client with a really neat system pretty quick as their 5 year old clone had died. Their comment was pretty neat too. They thought it looked like a space ship! There are some pretty neat chassis options out there right now and this is one of them. They give us an edge when folks are looking at replacing an existing system. So, here I am sitting in Edmonton International Airport. I pulled out the MacBook Pro and got ready to plug in the USB Internet stick after the MacBook finished booting. When I hit the power button on the MacBook, it did not power up . . . at all. So, out came BoeHueemuth (Monster Truck name in a Quentin Terentino movie), the Tecra S10. It fired up okay and I was able to catch some of the women’s hockey while waiting for my flight to be called. Then, while on the flight, I pulled out the Zone HD to have a listen to some tunes that fit what I was thinking about. It lasted about three songs before _it_ died! Okay, so the MacBook was the result of leaving it on after running some updates, getting distracted, and moving on to other things. That killed the battery as it sat in its spot for quite a while before being picked up for this trip. The Zune HD was used a lot without being plugged in to recharge and there was no thought to check the battery before leaving. Being prepared, whether it is for a trip like yesterday’s, or for a job that we are about to undertake, or even for a proposal presentation to a prospective client is absolutely critical to our success. We are helping out a consultant that is working with a new client that had a previous IT company drop a $15K box down and configure it with ADDS and Exchange … sorta. For some reason, e-mail stopped flowing at 05:00Hrs this morning. Once the send connector was created, e-mail started to flow as expected. The box is running Windows Server 2008 with Active Directory, DNS, DHCP, File Services, and Exchange 2007. One of our client’s proprietary applications called FormMaster has a built-in update feature. Enabling SOCKS proxy settings in the application in any combination would not work. Make sure the correct customer number, postal code, and phone number are in place. Check the Override Default Server Information and set the port number to 8093. Leave the Server Name field blank. After closing the application and clicking OK, the updates ran as expected. In this case, the IE7 icon had become disassociated with the VM’s IE7. This seems to be a consistent experience where the user creates a shortcut on their desktop to an app hosted in XP Mode. To “fix” the issue, delete the desktop shortcut and put a new one in place from the XP Mode Applications list on the Start Menu. On rare occasions, we have needed to log onto the XP Mode VM itself and reseat the updated application’s shortcut icon in the All Users Programs folder with a copy and paste over the original. Once the XP Mode Applications folder on the Windows 7 machine refreshed itself, we were able to recreate the shortcut on the desktop and the user was good to go. The Intel Modular Server that we used to generate our most recent clustering blog posts had three nodes, dual Xeon E5530 CPUs, and 24GB of RAM per node. It’s a little easier to manage the content of the site using SharePoint versus the SkyDrive setup. So, we will be migrating content from the SkyDrive onto our new SharePoint site. We use Kingston RAM because we have had a lot of success with their product and a virtually hassle free experience with their RMA process. We use Seagate SAS drives because we have had an overall excellent success rate with them. We will hopefully have all of the components we need to get a cluster up and running on the demo Intel Modular Server that Intel has sent us in time for my coming back from the Microsoft 2010 MVP Global Summit! When we do, we will schedule up a series of Webinars that will cover the various aspects of the cluster setup from the hardware configuration through to the software setup. History can teach us a lot. This video, is _really_ neat. While my own computing days started in the late 1980s, there are many folks that we communicate with that have been around technology for a long time. One of those, “. . . remember when . . .” moments. Feedback request: Since this is our first post of something like this, please let us know if this is something you like, or not. Poll: More Nostalgia posts or not? We just recently delivered a number of Acer laptops that we installed Intel 160GB SSDs and a fresh install of Windows 7 Enterprise x64. Today, one of the users called and said that she could not print anything. No printers were showing as available in Printers and Devices either. Anytime the Spooler Service was restarted and a print job or even a right click on a printer happened the service would die. To fix this, we needed to figure out which printer was causing the problem between the two HPs configured. One was an HP LaserJet 4345MFP which we have had no real issues with since day 1 and it has been running for 3 years. The other was an HP LaserJet 1022n printer. Unplug the printer and plug it back in again and nothing changed. So, we needed to somehow clean it out of the system and reinstall it. Once we removed the driver, unplugging and plugging the printer’s USB cable did nothing to bring it back. For this particular printer, HP only has the USB based Windows 7 x64 drivers which also installs a bunch of superfluous printer utilities. So, we ran the USB installer, found the temporary folder here. We copied the contents out and used the Add Driver wizard in Print Management to install the driver. Even then, the printer would show up in the Printers and Devices as _Unspecified_. When we went into the Device Manager, we did not see it listed there though which was really strange. We needed to click on View and Show Hidden Devices before the printer showed up. Once we saw it, we right clicked on it and clicked on Uninstall to remove the printer without enabling the driver delete option. One thing to note, once we removed the LJ 1022n driver, and recycled the Spooler service, a print job could be run through to the LJ 4345MFP. So, if the user was in a real pinch for something, they would at least been able to print their content before we went further in our troubleshooting and eventual reinstall of the LJ 1022n. We have been running at 110% for two and a half months straight with many very _long_ days. Time to take a bit of a break and spend some time with my family. A while back we posted about a hiccup with the Intel Desktop Board DQ45EK where we could not get an OS installed (previous post) with 4GB of RAM (2x 2GB) installed. After a _lot_ of troubleshooting, it turned out to be the BIOS. We backed the BIOS off and were greeted with an OS load and the type of system response times we would expect from that configuration. Intel has released a new version of the BIOS, version 0115. The problematic version was 0111 with the downgraded version we used being 0109. We will begin testing the setup to see if the new BIOS indeed resolves the problem. The writer indicates that the source is the Microsoft Exchange System Attendant service not running. The service was indeed not running. Now, why the service was not running in the first place is an unknown other than perhaps it did not start up after the Exchange 2007 Service Pack 2 installation. We will monitor the rest of our SP2 installs to see if this behaviour is consistent. We changed the Take No Action to Restart the Service. I share some thoughts on the various SBS migrations that we have run using the Microsoft migration method.